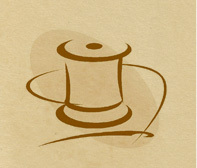 Charlie’s Aunt is the website of sewing pattern designer, author and journalist Emma Brennan. During the past 25 years, Emma has run a niche business designing vintage inspired fashions, accessories and costume jewellery alongside her career as a journalist in both broadcast and print. Her feminine but practical designs are influenced by historical fashions, ranging from the clean lines of 1920’s art deco to the inventive spirit of the 1940s make-do-and-mend era. She uses an eclectic mix of British tweeds, silks, vintage buttons, buckles and beads to create contemporary pieces with a dash of ‘retro’. Emma now combines working as a newspaper editor with designing, writing and publishing the Charlie’s Aunt range of sewing patterns. She is also the author of the popular books Making Vintage Bags – which has sold more than 60,000 copies worldwide – Making Vintage Jewellery and Making Vintage Accessories. The patterns and books have gained praise from enthusiastic sewers and crafters all over the world. In addition, Charlie’s Aunt was a shortlisted finalist in the Country Homes & Interiors magazine ‘My Country Business Awards’. The first Charlie’s Aunt pattern for Simplicity was also launched in spring 2018. 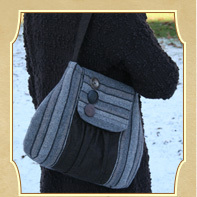 The Charlie’s Aunt range includes PDF sewing patterns and printed sewing patterns for Emma’s original vintage inspired handbags and accessories. To complement the patterns, Charlie’s Aunt also stocks a small selection of vintage and retro sewing supplies such as fabric, buttons and ribbons. All of the Charlie’s Aunt offerings are “unfussy” but with a hefty dose of 1940s inventiveness. To purchase PDF sewing patterns, vintage and retro sewing supplies and signed books , go to our online shop at www.charliesauntshop.com or our Etsy shop at http://www.charliesaunt.etsy.com or contact Emma by email. Emma is also a qualified further education tutor and runs a small number of courses in jewellery and handbag design in the UK. She writes articles and design projects for magazines on a variety of subjects. Oh yes….and one more thing, Emma does indeed have a nephew called Charlie! Catch up with all the latest Charlie’s Aunt news on our Facebook page. For more information on any Charlie’s Aunt products, please contact Emma.